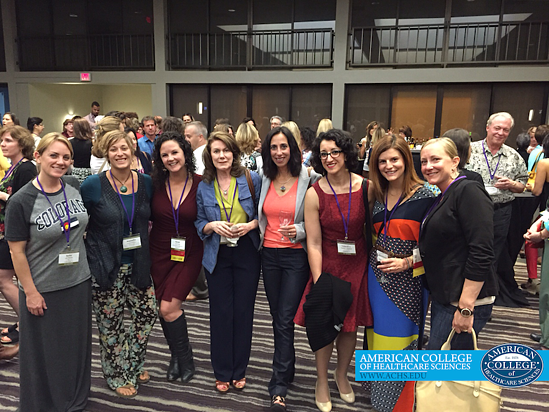 Earlier this month, I had the privilege of attending the annual National Association of Nutrition Professionals (NANP) Conference. I had been eagerly anticipating this event for over a year and may have even stalked the NANP Conference page regularly for updates on presenters and topics. It isn’t every day that this Midwesterner gets to be surrounded by like-minded nutrition professionals! I believe this is what drew me to the Conference. I was seeking nourishment for my mind and soul that could only be fulfilled by connecting with others in this profession. In fact, fast friendships seemed to blossom throughout the Conference as professionals and students alike took the opportunity to network. I received upward of 30 business cards and countless words of support and camaraderie. As a student, it was easy to feel intimidated and in awe of those who have been practicing in the nutrition field for years. But in fact, when speaking with most of these professionals, intimidated was the last thing I felt. Everyone I met was approachable, kind, and encouraging. As a registered nurse, I was also pleasantly surprised to meet many other nurses who had transitioned to a career in holistic nutrition. I felt an immediate connection with these women as they graciously offered me advice and support in my journey. My career goals felt more attainable after these encounters. Learning from the knowledgeable presenters was also a highlight for me. I was blown away by the experience many of these individuals had to offer. The theme of this year’s conference was “Revealing the Science Behind Holistic Nutrition.” As expected, the information presented was evidence-based and relevant to current topics and trends. Beginning with Dr. Ed Bauman’s opening keynote presentation and ending with roundtable discussions, the Conference was very interactive. The breakout session on cancer survivorship, led by Dr. Lise Alschuler, was among my favorites. It provided a very in depth and research-driven discussion, yet also included personal stories from co-presenter Karolyn A. Gazella. As an online student, I enjoyed the opportunity to be with the speakers, in person, and to feel engaged and motivated by the words spoken. My criticisms are few, but for the sake of being well-rounded, I will mention these briefly. As a plant-based eater, I would have valued a session regarding elimination of animal products and the associated health benefits. Recent research summed up in the documentary Cowspiracy also links animal agriculture to climate disruption and excessive use of resources. As nutrition professionals, I believe it is in our best interest to look at many aspects of health and wellness. What we eat impacts our environment and the world we live in. This is something we must address as responsible co-inhabitants of the Earth. 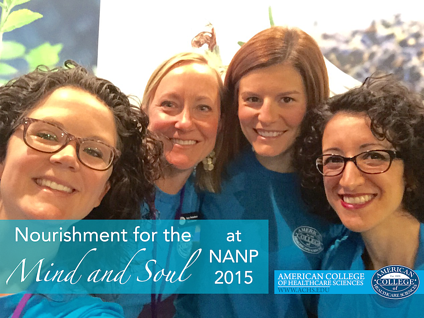 I am so grateful for my experience at the NANP conference. I am thankful for the people I met and the inspiration I brought home with me. I will definitely be attending in the years to come! Alyssa Zimmerman is a student in the Master of Science in Holistic Nutrition program at ACHS. She is a Registered Nurse with over five years experience in the hospital setting and recent experience working in the community as a school nurse. She is passionate about nutrition, wellness, and intentional living. Her career goal involves providing reliable nutrition information to individuals and communities. In her free time she enjoys practicing yoga and meditation, being outdoors, pondering life with friends and family, and spending time with the loves of her life, Doug (husband) and Macy (dog-child). Follow her on Instagram @alysszimm.